What is Jaundice and how common is it? Jaundice, a very common condition in newborns, is a condition in which there is an excess of a substance in the bloodstream called bilirubin- the yellow pigment of the red blood cell. Bilirubin is normally filtered through the liver and eliminated in the intestinal tract. Due to the excess yellow pigment in the blood, the infants skin and/or eyes become yellow. The condition is most common in infants who are born prematurely (before 37 weeks gestation) and also can occur at times in infants who are breastfed. While treatment is not always warranted, it is important to have your infant evaluated by a pediatrician if they are displaying signs and symptoms of jaundice outlined below. Due to the immaturity of the infant’s liver, babies are at times unable to remove bilirubin from their blood however sometimes there are underlying disease processes which may cause or contribute to the development of jaundice. Physiologic jaundice presents generally on the second or third/ fourth day following birth and is caused by an infants’ immature liver’s ability to adequately remove bilirubin which in turn causes bilirubin levels in the blood to rise (usually above 25 mg). Typically this resolves within two weeks. At times, babies who are breastfed go on to develop jaundice within 1 week following birth develop breastfeeding jaundice. This type of jaundice typically occurs when mothers do not produce an adequate milk supply or there are issues with the baby nursing. Breast milk jaundice on the other hand is a different form of jaundice which occurs in otherwise healthy breastfed babies generally during the 2 to 3 weeks following birth and may last for more than one month. It is thought that this type of jaundice is caused by substances within the breast milk which affect how bilirubin is broken down in the baby’s liver. Other causes include hemorrhage, infection/sepsis, liver malfunction, maternal–infant blood incompatibility, enzyme deficiency and/or abnormality of the red blood cells, premature birth and severe bruising at birth, such as in cases of bleeding under the scalp from delivery. During the second and fourth day of life, infants may exhibit yellowing of the skin and/or eyes which may signify the presence of jaundice. Although your baby will be evaluated in the hospital for jaundice, you can evaluate for this while at home simply by pressing gently on your baby’s forehead or nose in good lighting such a normal daylight. Mild jaundice may be present if the area you pressed turns yellow. Hospitals usually test babies for jaundice prior to discharge to ensure they go home only when it's safe. It is considered a medical emergency if your jaundiced infant develops a fever, is listless or is not feeding well. Normally, bilirubin levels peak between days three and seven after your baby is born and should be evaluated at 72 hours of life even if you have been discharged from the hospital prior to that. Most cases of jaundice do not require medical treatment however severe cases of elevated bilirubin levels can lead to brain damage. Complications of jaundice can be at times severe and include conditions such as acute bilirubin encephalopathy and kernicterus. Treatments of jaundice include the use of several modalities and include phototherapy (light therapy), intravenous immunoglobulin (IVig) and/or exchange transfusion. Making sure your infant is feeding well and getting adequate hydration is extremely important as this will promote an increase in bowel movements and thus excretion of bilirubin in the stool. Phototherapy is a method used to help your baby remove excess bilirubin in their urine and stool. During phototherapy, your infant will be dressed only in a diaper and will wear protective eye patches to protect them from the blue-green light that is emitted during this process. At times, a light-emitting pad/mattress may be used instead of the traditional lights. The use of IVig, a blood protein, is used in situations when the baby and mother have differing blood types. This condition causes the baby to carry maternal antibodies that play a role in the breakdown the infants’ blood cells. 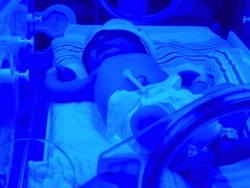 Exchange transfusions are rare and reserved to jaundice that fails to respond to alternate treatments; this performed in the neonatal intensive care unit (NICU). During this procedure your baby’s blood is exchanged for that of fresh blood. In some cases, jaundice is considered a normal occurrence however there are things that can be done to prevent its development. Most importantly is making sure your infant is fed adequately during the first several days following birth; it is recommended that infants who are breast-fed eat 8 to 12 times per day, and those who are receiving formula get 1-2 ounces every two to three hours per day during the first week following birth. Additionally, screening during pregnancy for maternal blood type and antibodies is recommended. Jaundice is not just limited to newborns and can occur at any age. There are several causes of jaundice which include certain blood diseases, genetic abnormalities, liver diseases including hepatitis and/or cirrhosis, bile duct blockages, certain infections and certain types of medications. Although uncommon, jaundice can occur in pregnancy, posing potentially serious health risks to both the mother and fetus. While jaundice has several varying causes, pregnancy specific causes include Hemolysis Elevated Liver Enzymes an Low Platelet count (HELLP Syndrome associated with preeclampsia), hyperemesis gravidarum, fatty liver,various forms of hepatitis and/or intrahepatic cholestasis of pregnancy. Symptoms of jaundice include the yellowing of your skin and/or the whites of your eyes. Should you be concerned about the presence of jaundice, call you healthcare provider for an evaluation. Approximately 3-5% of pregnant women may have abnormal liver function tests.